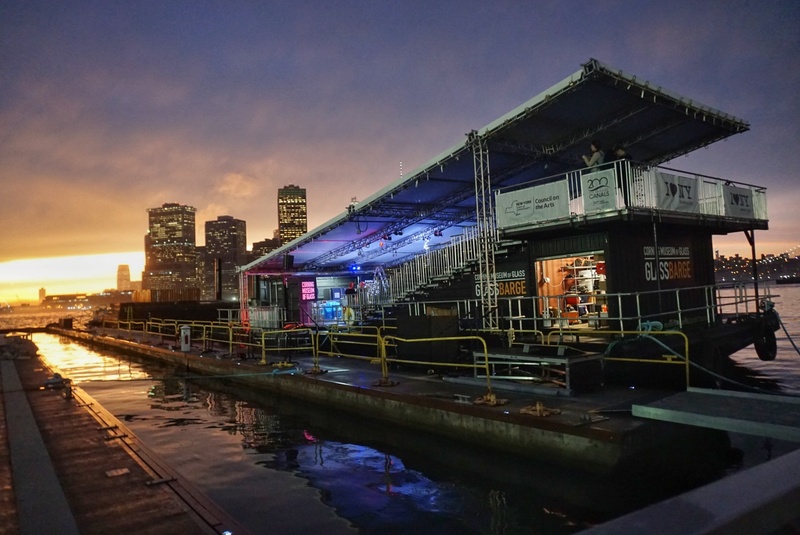 The Corning Museum of Glass launched?GlassBarge?today in Brooklyn! It’s the start of?a four-month tour as the barge will be traveling north on the Hudson River and westward along the Erie Canal, stopping in several Upstate New York cities on its way to Corning, NY. If you’re not familiar with this project, it’s a unique celebration commemorating the 150th anniversary?of the relocation of the Brooklyn Flint Glass Company?now known as Corning Incorporated?via the New York Waterways by canal barge to Corning. In addition to sharing the story of glassmaking in Corning, the recreation of the 1868 barge voyage emphasizes the continued role of New York?s waterways in shaping the state?s industry, culture, and community. ?GlassBarge?is the 2018 signature event for the statewide celebration of the?Erie Canal Bicentennial?(2017-2025). Other historic ships will accompany?GlassBarge?throughout the summer, including the Lois McClure, a replica of an 1862 canal barge, and the C.L. Churchill, a 1964 tugboat, both part of the permanent collection of the Lake Champlain Maritime Museum. Educators from the Maritime Museum will also share the story of canal life in the 19th century and how materials were shipped on New York?s waterways. Throughout its voyage,?GlassBarge?is under the flag of the South Street Seaport Museum and will be accompanied by the Museum?s historic tug W. O. Decker on the Erie Canal. ?The 1868 journey on New York?s waterways set in motion 150 years of innovation in Corning that has shaped the modern world. We?re so excited to tell that story beginning in Brooklyn Bridge Park, mere blocks from where it began?and on a canal barge, no less!? 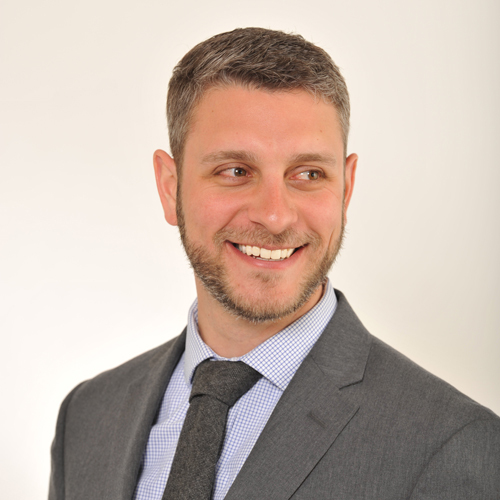 said Rob Cassetti,?Senior Director of Creative Strategy and Audience Engagement for The Corning Museum of Glass. GlassBarge?will visit ports in Yonkers, Poughkeepsie, Kingston, Waterford, Little Falls, Sylvan Beach, Baldwinsville, Fairport, Lockport, Buffalo, Medina, Brockport, Pittsford, Seneca Falls, and Watkins Glen, among others. A ceremonial last leg of the trip by land concludes in Corning with a community-wide celebration on September 22. In total, GlassBarge will travel to nearly 30 cities and towns, offering glassblowing demonstrations at each port. A full summer schedule is available below and at?www.cmog.org/GlassBarge. The?GlassBarge?journey is also being celebrated in Corning with a reinstallation of the?Crystal City Gallery, which also commemorates the 150th anniversary of glassmaking in Corning. The narratives explored in the Crystal City Gallery tell how the city became one of the premier centers for glass cutting in the United States, a trend in American luxury glass that developed as the Corning Glass Works was becoming established in its new home. 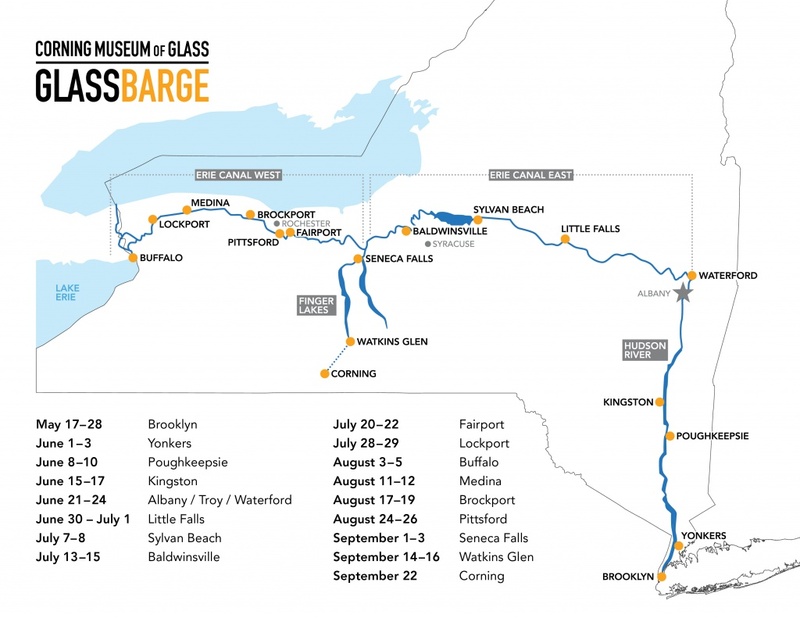 GlassBarge?makes its way across Upstate New York,?get to the CMoG website and make a reservation! Due to limited seating, reservations are strongly encouraged and can be made at cmog.org/glassbarge. Registration options will be available four weeks prior to each stop.